San Pedro Quiatoni is a small Zapotec mountain village in the eastern region of the Tlacolula Valley of Oaxaca, Mexico. For some inexplicable reason, the village collected Venetian glass beads that came into Mexico with the Spanish galleons along the trade routes between Veracruz, Acapulco and the Isthmus of Tehuantepec. The necklaces and earrings have become hard-to-find collectibles. 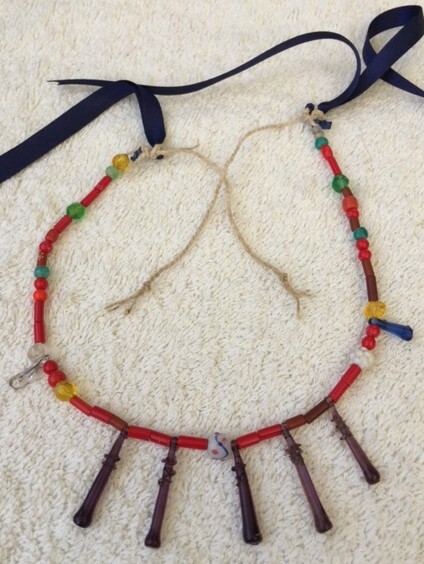 Early necklaces were strung with finely woven ixtle fiber, then later cotton. 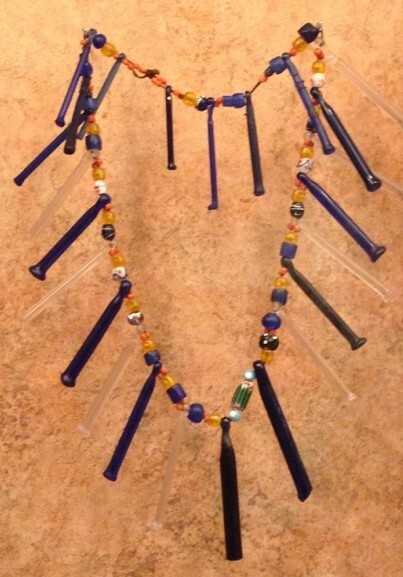 They typically included a mix of brown, clear, cobalt blue and light turquoise hand-blown slender glass rods of varying lengths, from one to three inches, interspersed with Venetian skunk (black and white) and colored handmade glass beads. Some say the rods originated from Puebla craftsmen. Others dispute this and insist they were part of the bounty coming from Europe to trade for gold, silver and cochineal. We do know that these particular necklaces have a unique provenance only to this one Oaxaca village, San Pedro Quiatoni. The women wore them for ceremonial occasions, part of the gala traje. Some were single strands. Others, double strands. Each one I found seemed to be unique to the person who assembled the beads based upon what was available and personal aesthetic. 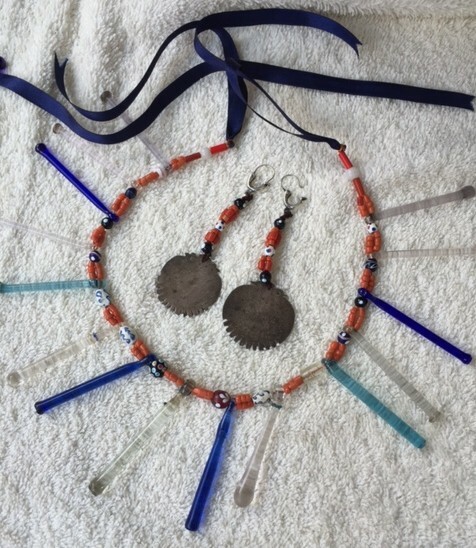 The necklaces, along with complementary earrings, were passed down through the generations, safeguarded in baules (treasure chest, hope chest) in the isolated village that is a good three hours from Oaxaca city. It wasn’t until the 1970’s, when the Pan-American Highway (Mexico 190) was paved that there was easier access. The old jewelry became a source of needed income for local families as collectors recognized the originality of design and age of the beads. 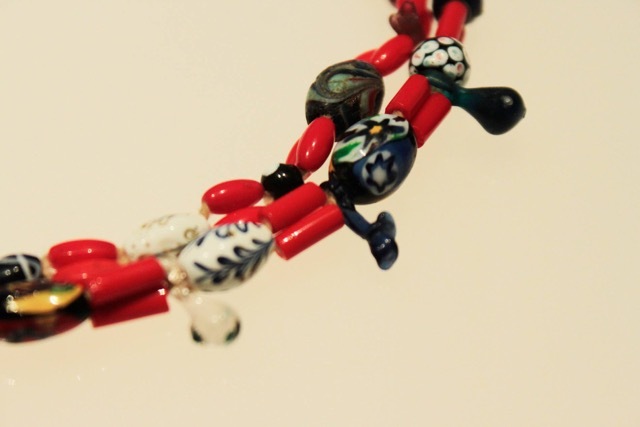 It is difficult now to find an intact strand of these glass beads on their original cord anywhere other than in museums or among private collections. 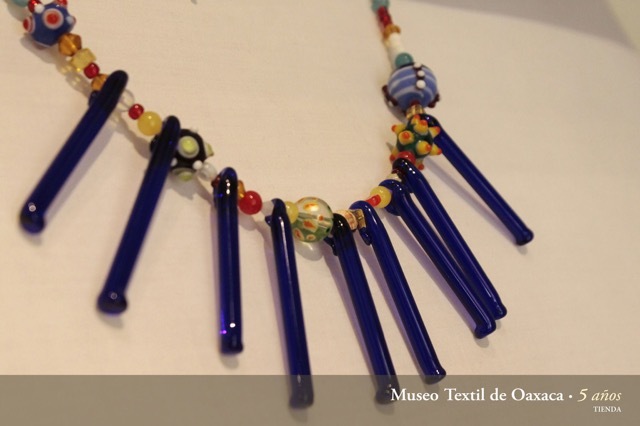 I became interested in the history of these necklaces last year at a Museo Textil de Oaxaca exhibition that included vintage San Pedro Quiatoni daily traje (dress) and accompanying necklaces. I tried to find glass rods in local antique shops to make my own necklace but was unsuccessful. 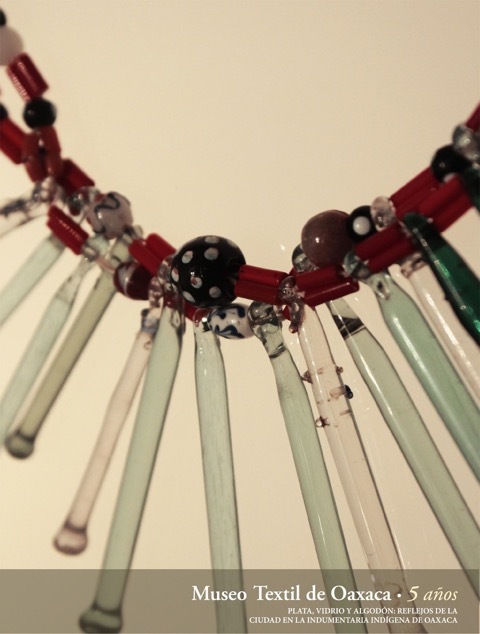 The reproduction necklaces for sale in the MTO gift shop, made by Xaquixe, sold out in days. My interest was sparked again this month when I went to visit the Mitla antique dealer I wrote about before. He pulled out three of these Quiatoni necklaces, obviously recently strung on silk cord, to show me. The prices were in the stratosphere even with the favorable dollar to peso exchange rate ($1=17 pesos). To even consider a purchase, I had to know more. So, I searched the Internet for a history of San Pedro Quiatoni beaded necklaces and what was available for sale to find comparables in quality and pricing. I wanted to know if what he was selling was really real! I saw old photos of village women wearing them. I saw 2002 festival photos with beautiful girls each laden with several strands. I sent an email to Old Beads owner Silva Nielands, an expert in old Mexican beads, as well as old beads from around the world. She had a Quiatoni necklace for sale, one of two that I was able to find online. It was a beauty and had already sold within days of being listed, she told me. Silva was incredibly generous with her advice and time, offering to look at photos I sent her to authenticate age and quality. She suggested a reasonable retail price for the necklace strung with old coral and I gulped again. 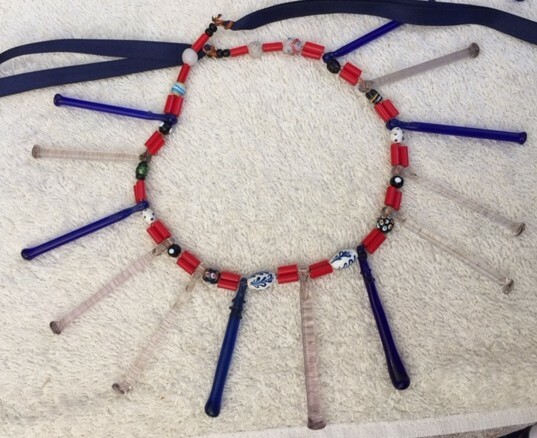 She noted that the white oblong beads with the blue squiggles on the necklace I was looking at are typical of those that came into Mexico and South America over 100 years ago, and the light turquoise rods are more rare and valuable than the clear or blue ones. 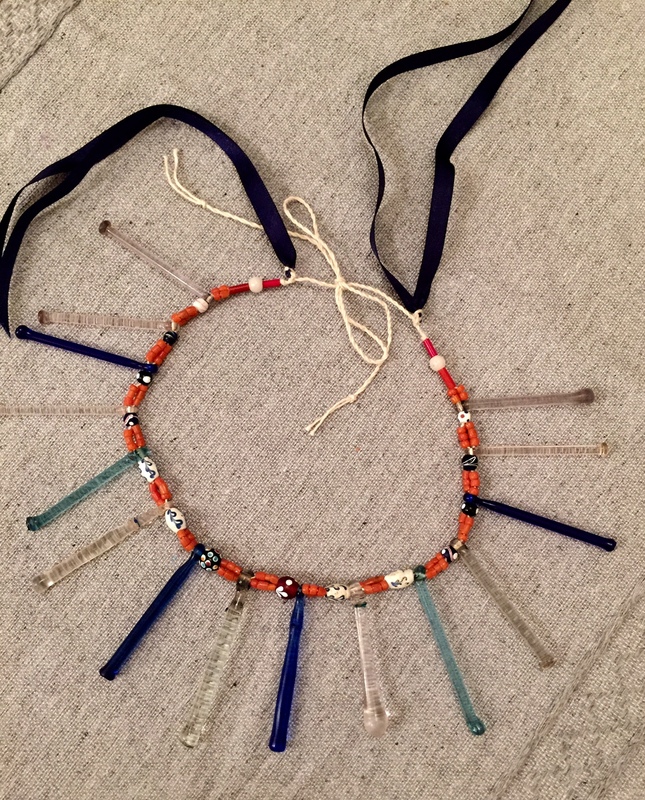 Most of these necklaces are adorned with red glass tubes, not coral, and may be newer. On my recent visit to the USA, I bought an old copy of Mexican Jewelry, the bible written in 1964 by Mary Davis and Greta Pack, and referred to it often during my investigations. 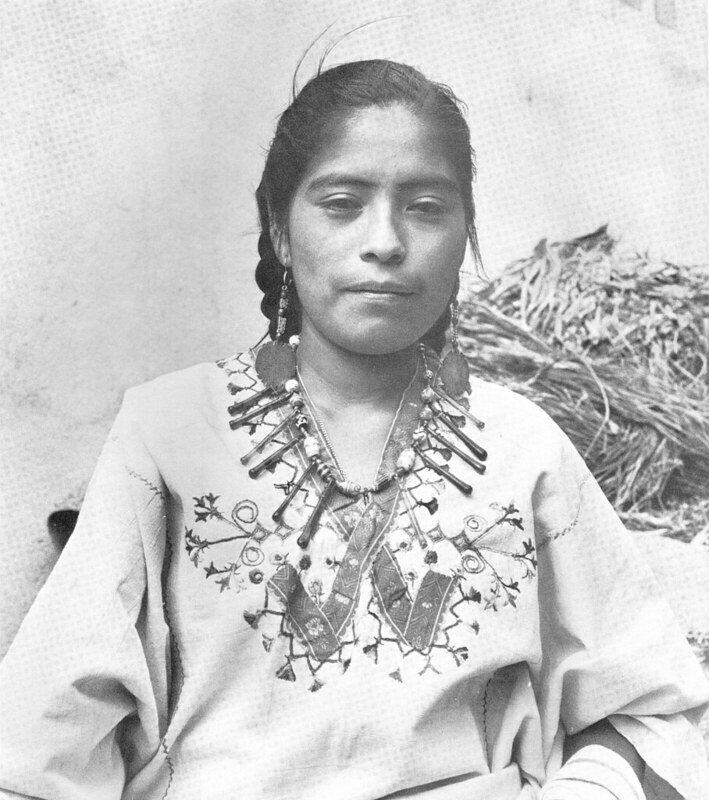 I also found, online, a history of beads in Mexico, The Margaretologist, Vol. 1, No. 4, 1987, Journal for the Center of Bead Research (see page 9 of the linked journal). I visited the necklace four times. I examined each bead and the stringing. I found several broken tips on the rods. I walked away. He called me and asked me to make an offer. I returned, questioned whether the stringing was done correctly to honor the original design — from my research, it wasn’t. So, I asked for the necklace to be strung correctly and then I would look at it again. According to my sources, the ribbons were originally used for decorations, not to tie the necklace. So this was a dead giveaway that the necklaces were strung improperly. The beads would have been strung on a cotton cord, which would be braided from the last bead to the terminus. In the two-week process, I also got negotiating coaching from my friend Scott who has been a trader here in the region for over 40 years. He advised that I admire, inquire and walk away. He suggested I do this several times, not my usual style, but I disciplined myself. I courageously asked the dealer to restring the beads and replace the rods with broken tips. This 14″ strand came in on turquoise embroidery floss. The short brown beads are old, and you can see the beautiful glass lamp work. Scott counseled that the dealer would respect me more if I made a reasonable offer that was fair to us both. Being that the dealer was as close to the source as I was going to get, on the return for the fourth time, I decided to start out by offering half his asking price to test what a reasonable offer might be. When we reached an agreement for less than what I had in mind, he invited me to return for a family dinner and gave me a warm embrace. I guess Scott was right! The earrings above have a silver disc hammered from an old coin, then cut along the edge to form a double-headed guajolote with feathers. The ear findings are original, too. They are now part of my collection along with the necklace, which now has a cotton cord for proper tying. The navy blue ribbon mimics some of the old pieces, but I’ve also seen photos of these necklaces without the ribbon. This entry was posted in Clothing Design, Cultural Commentary, Jewelry and tagged antique, bargaining, collectible, earrings, glass, jewelry, Mexico, necklace, Oaxaca, price, San Pedro Quiatoni, Venetian. Bookmark the permalink. Hi Norma such an interesting post as I collect old Venetian beads in Guajarat, India. They were used less as jewellery and more as fringes on hangings although some old Rabari necklaces have Venetian glass beads. On my next tour in March we are visiting an Indus Valley region where carnelian beads are still being produced. Some traditions continue. You mean the ‘confetti’ one – black ground with ikat stripes and bright colors mixed in?? ?….that’s Fito Garcia Diaz who is the maker. He’s #2 on your tour. He’s considered one of the ‘innovators’ of rebozo design. I love his color combos. Take lots of pictures – I’m going to pick your brain when you come back!!! LOVE this post Norma. It really give a lot of information about these beautiful and rare necklaces. You’ve done your homework and now you have a really fine part of Oaxaca’s history. Don’t you just love it!!??? Soon you’ll have some amazing Tenancingo rebozos – can’t wait to see what you discover there. A FAV place of mine too. Sheri! Thanks so much. And I’m off to Tenancingo because of you! Ease share name of multiple-colored rebozo weaver. I want one! You textile maven.